A nonprofit organization that advocates for the U.S. Army recently provided funding to assist patients at the domiciliary at the Eisenhower VA Medical Center with their rehabilitation program. The Henry Leavenworth Chapter of the Association of the United States Army (AUSA) donated $750 to Midwest Adaptive Sports so that patients at the VA could enjoy a day of skiing at Snow Creek ski resort in Weston, Mo. 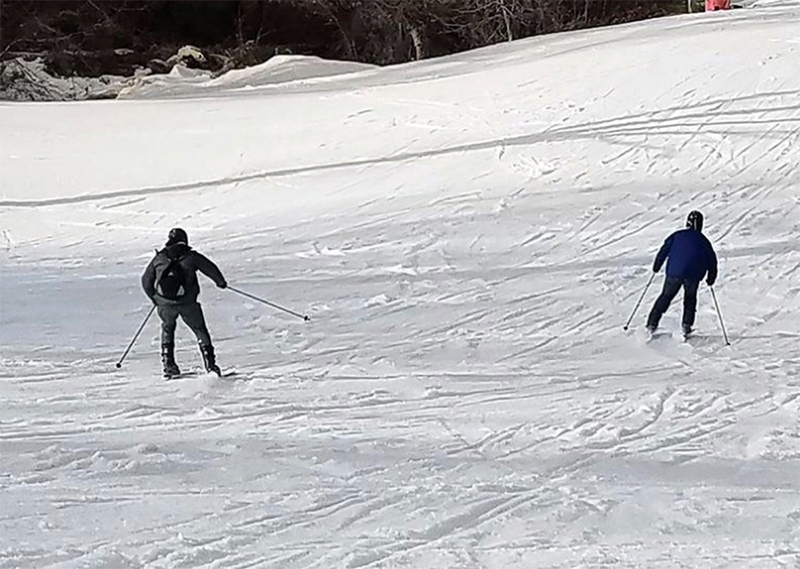 Patients from the Eisenhower VA Medical Center ski down a hill at the Snow Creek ski resort as part of their recreation therapy program. A group of approximately 10 domiciliary patients took part in the trip to the ski resort as part of their recreation therapy program. Participants spent approximately four hours on the slopes. Al Mueller, a ski instructor at Snow Creek, helped facilitate the wounded warriors’ visit to the resort. Cal Johnson, president of the local Leavenworth AUSA chapter, said the ski trip was part of the organization’s Helping Our Own at Home initiative. He said the ski trip was one of numerous initiatives that AUSA supports to help veterans and their families. Johnson said the organization donates approximately $15,000 each year to Army service members and their families. According to the chapter secretary, Judy Bauer, AUSA also donated money to the Family, Morale, Welfare and Recreation fund at Fort Leavenworth and the Better Opportunities for Single Soldiers program at that military installation. Each year, the AUSA chapter hosts a golf tournament as its primary fundraiser. This year’s tournament is May 4 at Leavenworth Country Club. Snow Creek is in its 32nd year of operation. The resort features 12 trails of varying degrees of difficulty and five snow tubing lanes that are 700 feet long. The ski resort has more than 60 snowmaking machines. The resort is open for business from mid-December through mid-March. For more information about Snow Creek, call (816) 640-2200. For more information about the AUSA Henry Leavenworth Chapter, call (913) 684-7778.